“Ninety crore people today have access to telecommunication up from the 7 crore having access a decade ago. 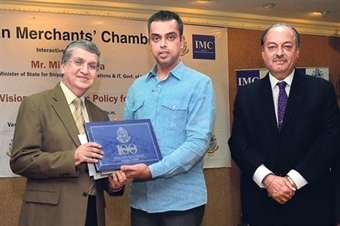 Also the number of people having access to internet has gone up from 10 lakh a decade ago to 24 crore now”, said Union Minister of State for Shipping, Communications and IT Milind Deora on the achievements of the UPA 2 at a meeting at Indian Merchants Chambers (IMC). Deora, the Congress candidate for the forthcoming Lok Saba polls from the Mumbai South constituency accepted that the last quarter of the decade old rule of UPA 2 was quite bumpy, but also clarified that since India was now a part of the global economy, it was affected by the sinking US and European crisis apart from the rising oil prices and inflation. We need to help our manufacturing sector to grow extensively, which will help absorb a large number of youths. We have taken a number of steps in the electronics sector and hope to see the results in the next few years. We intend to make India the manufacturing hub for chips, said the young MP. For a country to progress, it requires a stable government and the Prime Minister needs to be socially acceptable. BJP’s prime ministerial candidate Narendra Modi and his methodology of governance can never be a socially acceptable one. Vajpayeeji was a moderate face and his government was mature and socially acceptable, he said. 24X7 news channels, social media revolution can help bring change in governance and also improve transparency and reduce corruption, he added. Deora also claimed that there must be a political consensus on leaders with criminal cases lodged against them to be barred from contesting polls. There is a difference between an allegation and conviction, he concluded.